You are currently browsing the tag archive for the ‘Oregon Culinary Institute’ tag. At NWEI, we believe the solution to many of Earth’s biggest challenges lies in the power of collective change: by taking action in our own lives and inspiring the people around us, each of us contributes to a world of impact. Over the last 20 years, NWEI has helped more than 140,000 people from around the world make small steps that lead to big changes for our planet. Thanks to the Spirit Mountain Community Fund, Northwest Earth Institute is pleased to offer 1,000 free discussion course books to Portland-area students during the 2012-2013 school year. 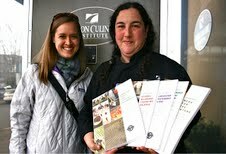 Oregon Culinary Institute has been one of the most active participants in the Spirit Mountain Community Fund Grant. More than 300 colleges and universities throughout North America have successfully used NWEI course books in a wide range of academic disciplines and institutional settings. The student-led curriculum encourages critical thinking and active learning, and helps students find “Aha!” moments about the way they live, work, create and consume. TODAY Marks NWEI’s 20th Anniversary! We’ve Launched a New Website and New Online Community EcoForum! New Website and Online Community EcoForum Launching Thursday! Sneak Peak Webinar Tomorrow!